Blush knit hoodie with frayed edges and front silver zipper. 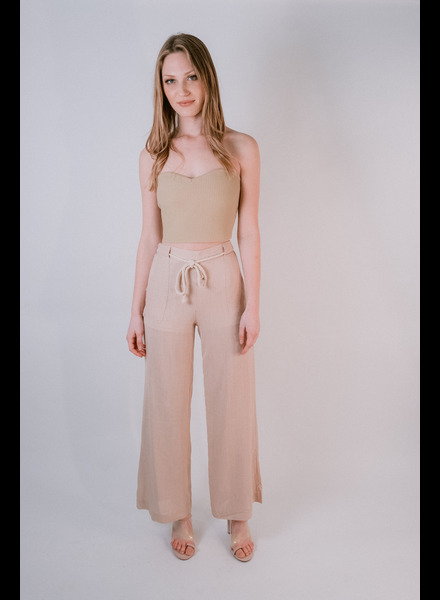 Model is 5’9” and wearing a size sold. Skirt sold separately. Striped raw hem cropped pants with front tie. Top sold separately. Model is 5’9” and wearing a size small. Striped raw hem tank with shoulder ties and front buttons. Pants sold separately. Model wearing a size small. Black and white piinstriped mini skirt with single side butotn. Model is 5’9” and wearing a size small. Top sold separately. Black and white pinstriped halter style top with triple back ties. Model is wearing a size small. Skirt sold separately. Vintage rose aztec halter tube top. Coordinating pants sold separately. Model is wearing a size small. Neutral striped, lightweight, woven wide leg pants with side pockets and rope belt. Coordinating shorts and jacket are sold separately. Model is wearing a size small. Neutral pinstriped track style shorts with elastic drawstring waist and side pockets. Coordinating jacket is sold separately. Model is wearing a size small. Neutral pinstriped lightweight, hangy blazer style jacket with cuffed 3/4 sleeves, oversized side pockets and 2 front buttons. Coordinating shorts and pants sold separately. Model is wearing a size small. Slinky, spandex blend bra style top with elstic string straps. Coordinating biker shorts are sold separately. Model is wearing a size small. Slinky, spandex blend, high waisted biker shorts. Coordinating bra top is sold separately. Model is wearing a size small. 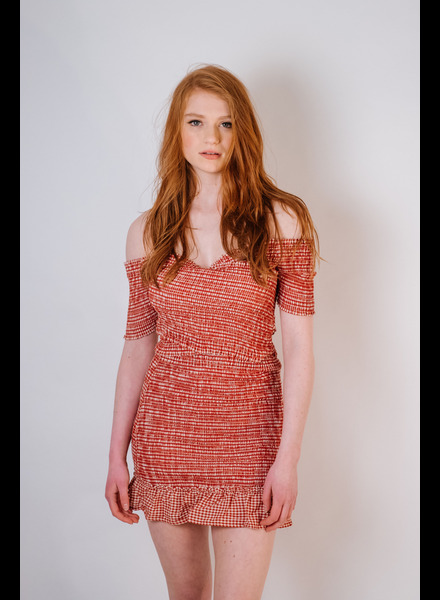 Apricot linen fitted mini skirt. Fully lined. Model is 5’9” and wearing a size small. Apricot colored hankerchief top with gold coin details. Model is wearing a size small. Smocked red and white gingham printed short sleeve and off-the-shoulder cropped top. Coordinating skirt is sold separately. 100% cotton. Model is wearing a size small. Smocked red and white gingham printed skirt with ruffle bottom hem. Coordinating top is sold separately. 100% cotton. Model is wearing a size small. Coordinating lilac colored, high waisted jogger style pants with adjustable elastic pull-tab. Model is wearing a size small. Coordinating jacket is sold seperately. Coordinating liliac colored 1/4 zip cropped jacket with front zipper pocket and elastic pull-tab bottom. Model is wearing a size small. Mint colored ribbed short sleeve open tie front top. Matching dress sold seperately. Model is wearing small.